It's not often that in-house elections for union leadership positions have nationwide political ramifications, but the one held yesterday in Los Angeles to elect a replacement for Gerald McEntee, the very-longtime president of the 1.3 million-member American Federation of State, County and Municipal Employees, almost certainly did. For starters, of course, AFSCME has found itself very much at the front lines of the Republican move against public-sector unions. Beyond that, as I laid out in a piece for the magazine two months ago, the election raised the prospect of a realignment of the relationship between AFSCME and the national Democratic Party. Danny Donohue, the leader of the largest public-sector union in New York, declared that AFSCME needed to spend less on the Beltway political game (for instance, spending on party conventions and a $1 million ad buy against Mitt Romney in Florida during the Republican primary there in January) and instead invest more in local organizing and politics, which he argued would help stave off disasters like the takeover of Wisconsin by Republican dead set on eviscerating unions. 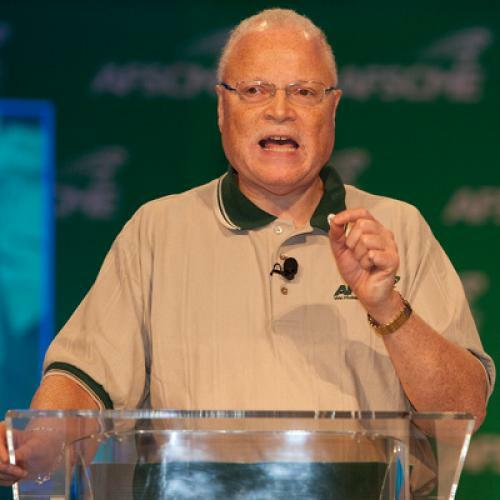 Lee Saunders, the designated successor to McEntee who has spent most of his career at AFSCME's Washington headquarters, argued that it was foolish to think that AFSCME could pull back from national politics and Beltway influence and still serve its members and cause. Well, Saunders won, with 684,000 votes to Donohue's 582,000, a larger margin than their face-off two years ago for the union's number-two slot. What does this mean for the union and the Democratic Party? There's some question of how much Donohue could have transferred this approach to Washington -- after all, there are precious few Republicans anymore outside of Northeastern states like New York that are willing to work with unions. But there would have been at least an attempt at a truly new approach at AFSCME after three decades under the leadership of one man, McEntee. It's possible that Saunders will make a break from the path of his predecessor, but less likely. One could argue that this is a loss for the union, that it really could have benefited from a new look in the wake of its devastating loss in Wisconsin two weeks ago. Then again, though, I've been arguing, as I did again on PBS Newshour this week, that the import of that loss should not be overstated, given that voters in a larger, more conservative state (Ohio) backed the unions in a big way only eight months earlier. Yes, unions are under great stress now, and yes, their relationship with the Democratic Party is going to change. But with Saunders hanging on, that relationship is probably going to evolve more slowly than it might've.